With cold and flu season coming up, it's a great time to make a carry around portable tote that is stocked with all the supplies a family member would need to have bed (or couch) side when they are feeling under the weather. 1) One for the house that is easy to tote around. Grab a plastic shower caddy for around $2.00 if you don't have one. It's worth it to have the grab and go handle. 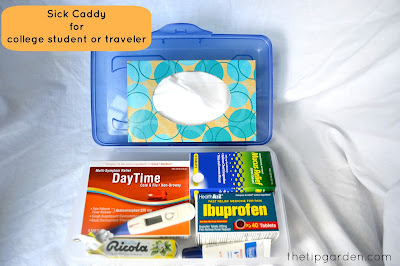 2) A mini version to mail off to college students or send along with a traveling family member. 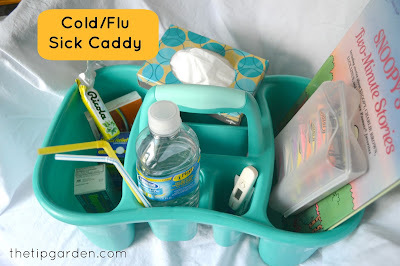 I send off in a plastic pencil case box to my college aged children or anyone traveling, so when a cold or flu strikes they don't have to crawl their way to a store to pick up supplies while they feel yucky. Having a "go to" box with all the basics will get them feeling some relief right away. What you store in yours is completely dependent upon the age of your family members. For children you may want a few fun things to do and less medication stored in it, for teens and adults you may want more over the counter medications in there within reach. I'll share a few ideas to get you started. The doctors and pharmacy phone numbers written on card and taped to the caddy. For college student caddy include a copy of the insurance card too. I always grab a few new dollar store toys/activities that they have never played with before. It's nice to have some options when they've watched too much tv but can't run around yet. silly putty/comic section of newspaper. SUGGESTIONS??? WHAT ELSE SHOULD WE INCLUDE? What a great idea Jan! I am going out tomorrow to get everything I need to make and send one to my son in college! My daughter just called home from school, sick! So glad I had stocked her up during the summer. I hope your son never needs it! Love this! I am going to get a couple ready for cold season!